Primary English Medium School Teachers Orientation Training in District Level: AP Conduct Divisional Level Orientation Programme to the Teachers of English Medium Primary Schools, AP Rc.No.254 - 5 day training to all the teachers of primary English medium schools and Primary Teachers Orientation Training Time Table. Proc. Rc. No. 254/B/SCERT/2018 Conduct of divisional level orientation Programme to the teachers of English medium primary schools in non-residential- certain guidelines issued-Reg. 2) Instructions of the Commissioner of School Education. 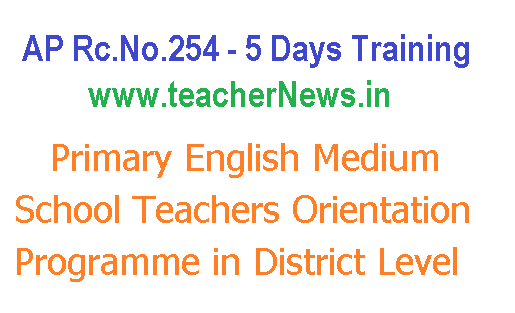 AP Rc.No.254 - 5 day training to all the teachers of primary English medium schools. All the DEOs in the State are informed that the Government of Andhra Pradesh has introduced parallel English medium sections in 7461 primary schools. In order to develop required proficiency in teaching all the subjects in English medium effectively, the Department of school education has prepared an informative handbook titled KNOW -HOW and already organized a 5-day TOT for both SRP and DRPs by SCERT successfully. In this connection, the Department has decided to conduct a 5 day training to all the teachers of primary English medium schools (7461) from 28.11.2018 to 02.12.2018 at division level in all the districts and for Kurnool district in 2 spells i.e. spell I, 28.11.2018 to 02.12.2018 and Spell 2, 03.12.2018 to 07.12.2018 the trained SRPs and DRPs as per the guidelines stated below. The division level training Programme should be conducted as a 5-day non-residential Programme from 9.00 AM to 5:00 PM. ఆంగ్ల మాధ్యమం ప్రాథమిక పాఠశాలల ఉపాధ్యాయులకు వృత్యంతరశిక్షణ. AP Conduct Divisional Level Orientation Programme to the Teachers of English Medium Primary Schools,Primary English Medium School Teachers Orientation Training in District Level RC 254.